The hot hatch is back. Mixing exciting driving experiences, versatile interiors, and the latest technology, the new hot hatch demonstrates that you can have sensibility and driving enjoyment in one package. The hum-drum city car – stingy at the pumps but not too much fun on the road – is being left behind. Instead, cars like the 2019 Toyota Corolla Hatchback are rising up. Seating for five, plenty of storage with all seats up and even more with the back row folded down, and the latest and greatest safety and infotainment technology makes it a great package – and it’s even better when you consider the price tag. How does it match up against established competition such as the 2019 Hyundai Elantra GT though? Is the Toyota Corolla or the Hyundai Elantra a More Powerful Vehicle? With a single capable engine, the real question with the 2019 Toyota Corolla Hatchback is whether you want manual or automatic. Pair the six-speed manual with the 2.0-liter engine, and you get 28 MPG city and 37 MPG highway. Go for the intelligent Continuously Variable Transmission, and you’ll see 32 MPG city and 42 MPG highway. Either way, you’ll be able to tap into 168 horsepower and 155 lb-ft of torque, plenty of zip for this lightweight car. If you’re staying out here in Harrisburg or Reading, the manual transmission is a purist’s dream – although if you’re headed into Pittsburgh, the automatic will be the better option for stop-and-go traffic. The 2019 Hyundai Elantra GT offers two engines, with a catch. The base 2.0-liter four-cylinder engine lags a little behind the Corolla in terms of power, at 161 horsepower and 150 lb-ft of torque. Not too awful, until you consider the fuel mileage – with the manual transmission, it’s estimated at 23 MPG city and 31 MPG highway. The automatic isn’t much better, at 24 MPG city and 32 MPG highway, or eight to ten MPG worse than the Corolla hatch. Even though the Corolla has a 13.2-gallon tank versus a 14-gallon tank in the Elantra, you’ll go further per fill-up in the Corolla. The GT does offer a high-powered turbocharged engine, but there’s the catch – it’ll cost thousands more than the top Corolla Hatchback trim, and that’s before you start adding in creature comforts. Does the Toyota Corolla or Hyundai Elantra GT have better Safety Features? The streets of Bethlehem and Hazelton are generally pretty safe, but it never hurts to have technology by your side to help you avoid accidents. 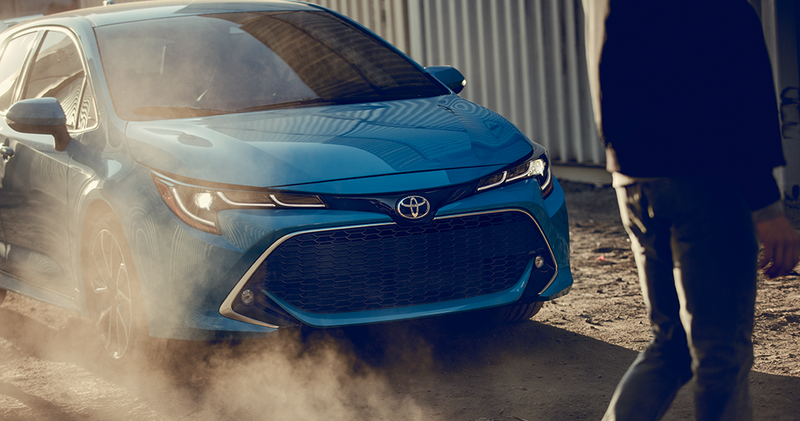 When it comes to safety tech, the 2019 Toyota Corolla Hatchback is unsurpassed. Every single trim features the Toyota Safety Sense 2.0 system, which features a Pre-Collision System with Pedestrian Detection, including cyclist detection and improved low-light capabilities, along with Lane Departure Alert with Steering Assist and Road Edge Detection. Dynamic Radar Cruise Control and Automatic High Beams are also part of this system. All of this helps to improve safety, not just for you, but for pedestrians and other drivers on the road with you. The 2019 Hyundai Elantra GT doesn’t provide any of these safety systems as standard. In fact, save for Blind Spot Detection with Rear Cross-Traffic Alert and Lane Change Assist, none of them are even optional on the base level. You’ll have to pay up for the turbocharged Sport trim, and even then, everything that is standard in the Safety Sense system is a cost-adding option. Is the Corolla or Elantra a more comfortable vehicle? Inside the cabin, the 2019 Toyota Corolla Hatchback offers impressive fit and finish throughout. You can’t expect to find luxury finishes at bargain prices, but you should at least get materials that are substantial, and a layout that takes the needs of the driver and passenger into consideration. While both vehicles have a standard six-way adjustable driver seat, only the Corolla offers an optional eight-way adjustable option. While the 2019 Hyundai Elantra GT offers a leather-wrapped shift knob and steering wheel as an upgrade option, a leather-trimmed steering wheel is standard across the Corolla Hatchback range. The 2019 Toyota Corolla Hatchback is also the only one of the two to offer a high-end JBL premium audio system featuring eight speakers and Clari-Fi Music Restoration Technology. Is the 2019 Corolla or the 2019 Elantra GT a More Reliable Vehicle? You’re making a massive investment when you purchase a new vehicle. You expect it to provide reliability year after year, and you expect a good return from it when it is time to upgrade. 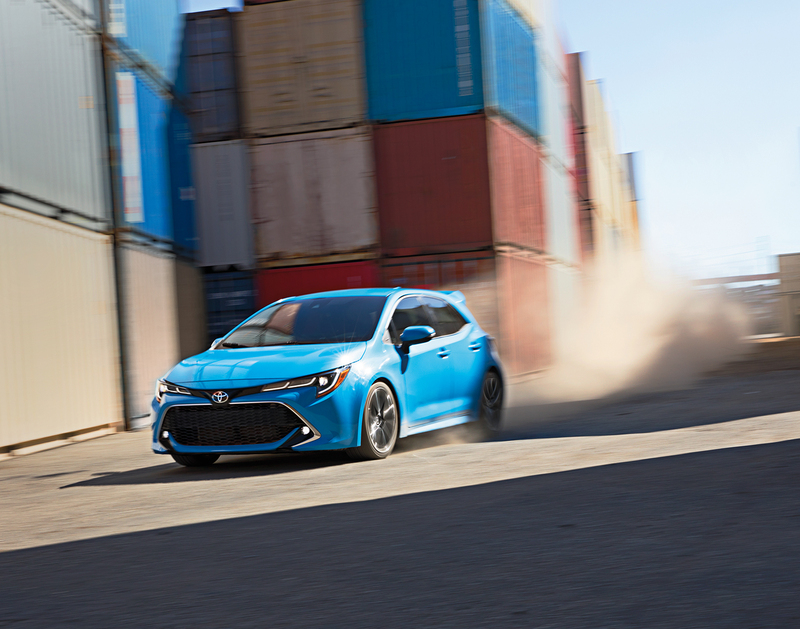 The 2019 Toyota Corolla Hatchback is part of a generation of Toyota vehicles that have been rated as the most reliable on the road, year in and year out. For six straight years, Toyota has been the top non-luxury brand in Consumer Reports yearly reliability rankings. Hyundai is well down, in the middle of the pack. Same goes for resale value. For the last two years, and for three out of the last five years, Toyota has been named the best brand for retaining resale value over their first five years by Kelley Blue Book, the definitive vehicle resale guide. In fact, Toyota has won the award more times in its history than any other brand. While Hyundai has never won it. Which Sedan is the better buy? Corolla or Elantra? The 2019 Toyota Corolla Hatchback comes through where it is most important to the car buyers in Harrisburg and Reading, and around the country – value. While the 2019 Hyundai Elantra GT touts features such as dual-zone automatic temperature control, front seats, and leather seating surfaces, Hyundai holds buyers hostage by only pairing them with the more-expensive turbocharged engine, or making them part of an extraordinarily expensive option package. In fact, to match the 2019 Toyota Corolla Hatchback XSE’s package, you’ll need to opt for packages that add thousands to the Elantra GT’s starting price. For our neighbors in Harrisburg and Reading, Bethlehem and Hazelton, we’d expect that you brushed the 2019 Hyundai Elantra GT off after the first two sections. After all, how useful can a vehicle be if it doesn’t keep you safe, and is going to cost you a big chunk at the gas pumps? Here at Freedom Toyota of Harrisburg, we want everyone in our community to feel comfortable on the road, which is why we feel the 2019 Toyota Corolla Hatchback is hard to beat when it comes to a small, fun-to-drive hatchback that offers easy cargo carrying and the latest tech features.